The rafters of Mohegan Sun Arena at Casey Plaza are home to three conference championship banners, a handful of divisional titles, and a motley assortment of promotional banners and souvenirs from previous years advertising schemes. To date, no numbers have been retired by the team, although no one has dared wear 66, 68, 71 or 87 in Wilkes-Barre/Scranton. Soon that will change. The number 29 should not be worn by any future Wilkes-Barre/Scranton Penguins. Although Marc-Andre Fleury wore the number 29 in Wilkes-Barre/Scranton from 2004-2008, the banner that one day will hang in Wilkes-Barre honoring number 29 will bear another name: Tom Kostopoulos. Kostopoulos was picked in the 7th round by the Pittsburgh Penguins in the 1999 Entry Draft during the dark ages when the Pittsburgh Penguins faced an uncertain future full of bankruptcy and relocation rumors. Kostopoulos was immediately assigned to the Wilkes-Barre / Scranton Penguins for their first season in the AHL in 1999-2000. As a fresh faced rookie entering the American Hockey League in 1999, Kostopoulos played in 76 games and posted 58 points (26 +32). Kostopoulos’s early years were spent largely sheltered in the AHL. 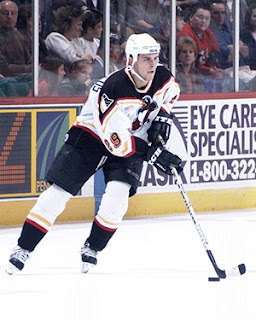 During his first stint in WB/S Kostopoulos was on two teams that reached the Calder Cup Final, and he posted 231 points in the AHL from 1999-2004. T.K. in his younger days. Despite exceptional gritty play, his now famous work ethic, and a solid scoring touch, there was simply no room for Kostopoulos on the Pittsburgh Penguins roster until the 2001-2002 season, when Kostopoulos was called up to Pittsburgh for 11 games. By the 2003-2004 season, Kostopoulos had outgrown the AHL. He played in 60 NHL games for Pittsburgh and just 21 AHL games. 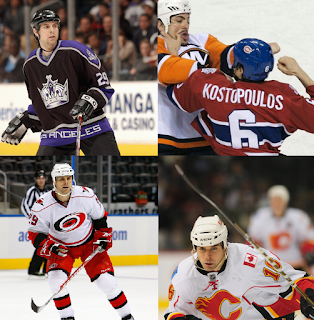 At this point Kostopoulos was 25 years old and his time as an NHL regular had finally arrived. Unfortunately, for Kostopoulos the 2004-2005 season was lost due to lockout, taking away what could have been one of his most productive NHL seasons. Nevertheless, Kostopoulos was an NHL regular for the LA Kings, the Montreal Canadiens, the Carolina Hurricanes, and the Calgary Flames from 2005-2012, before returning to Wilkes-Barre/Scranton for the 2012-2013 season. Despite a brief waiver wire claim by the New Jersey Devils for 15 games in 2013, Kostopoulos was again able to return to the Wilkes-Barre Scranton Penguins for the 2013-2014 season. Kostopoulos has been the captain of the team ever since. Kostopoulos wearing the "C" as is customary in Wilkes-Barre/Scranton. Over the past five seasons Kostopoulos has racked up 226 points, and the 38 year old lead the WB/S Penguins in scoring in 2016-2017. He plays like a man half his age night in and night out and has been the face of the AHL Penguins franchise for the past 18 years. He has also excelled in his the role of mentor and has helped former line mates like Connor Sheary and Jake Guentzel find success in the NHL with Pittsburgh. Although number 29 should find its way into the rafters high over the ice in Wilkes-Barre soon, hopefully this will not happen too soon. Tom Kostopoulos has signed a one year contract with the Wilkes-Barre /Scranton Penguins for the 2017-2018 season, his 19th as a professional.